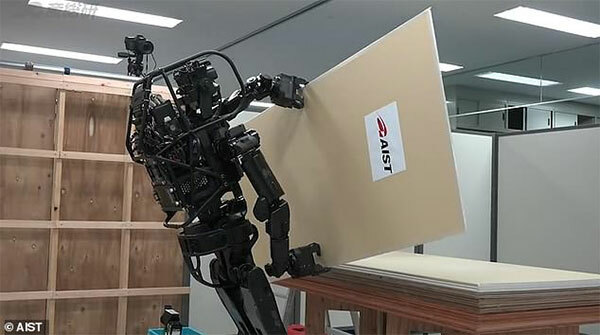 A Japanese research institute has produced an android that can perform tasks on construction sites, including installing drywall panels by picking them from a stack and screwing them into position.It takes human form so it can do things in a workplace designed for humans. This addresses a problem with industrial robots, which is that industrial processes usually have to be designed for them, rather than the other way around. The robot is the HRP-5P, the latest prototype from Humanoid Research Group (HRG) of the National Institute of Advanced Industrial Science and Technology (AIST). It can detect objects, plan routes around obstacles and analyse its environment by, for example, measuring the sizes of things. It also has the standard advantage of industrial robots in that it has an extra joint in its wrist. The HRG views the android as a platform for further collaboration between industry and academia, and sees its long-term role as replacing or supplementing human labour on construction sites, factories and shipyards and other real-world environments. The move to non-human labour is a priority of the Japanese government and industry. The Japan Federation of Construction Contractors estimates that there will be 1.3 million fewer construction workers by 2025 compared with 2014.